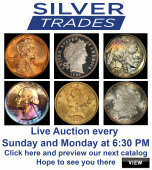 STARTING TONIGHT AT LOT 413, still 200+Lots still to come; incl 1928 Hawaii Commem 50c ms65+, 1896-o Morgan ms62+, 1901-p Morgan ms62, 1878 $3 Gold ms64+, Vam's, Mint Error’s, Varieties & much more..
You've been outbid to 4****t! to YOU! You've been outbid to 1****5! to YOU! You've been outbid to N****7! to YOU! Indian Head Penny 1c Shotgun Roll, 1902 on one end, reverse on the other. Shotgun Roll of Indian Cents from Consignee's Estate. Actual roll pictured is the roll yo...moreu will get. A great bank shotgun roll of Indian cents 1c. From the feedback we have received, the rolls are filled with a mixture of 1800's and 1900's. The folks who have gotten them have also said that they are better than average circulated condition and all nice Indian cents. All of the shotgun rolls we currently have up are from One Consignee's Estate. A difficult to find original roll. This particular Roll shows an 1902 on one end. NGC 1946-s BTW Old Commem Half Dollar 50c Graded ms64 By NGC. When examining a Booker T. Washington commemorative look for wear on the high points, on the obverse that i...mores Mr. Washington's right Cheek (from his perspective), and on the reverse the arches on the top building.